For many of our guests, fishing is the highlight of our river-based wilderness vacations. Fishing on some of northern Canada’s remotest rivers is a unique experience ­– one that every angler, novice to expert, should try. Having to survive in these northern waters, fish tend to be wilder and more aggressive, preying on whatever bugs or fry come their way. Beginners are able to enjoy great success, and experts have more fun fishing under these optimal conditions. Picture yourself standing under the midnight sun casting a lure or fly into a small eddy, watching the flash of grayling – one after another – line up to snack on your presentation. With so many rivers and lakes to choose from (and the elbow room to spread out! ), fishing in Canada’s north can’t be beat. You’ll enjoy fly- or tackle fishing for grayling, Dolly Varden, char and inconnu – species generally unique to the north and that offer great sport fishing opportunities. 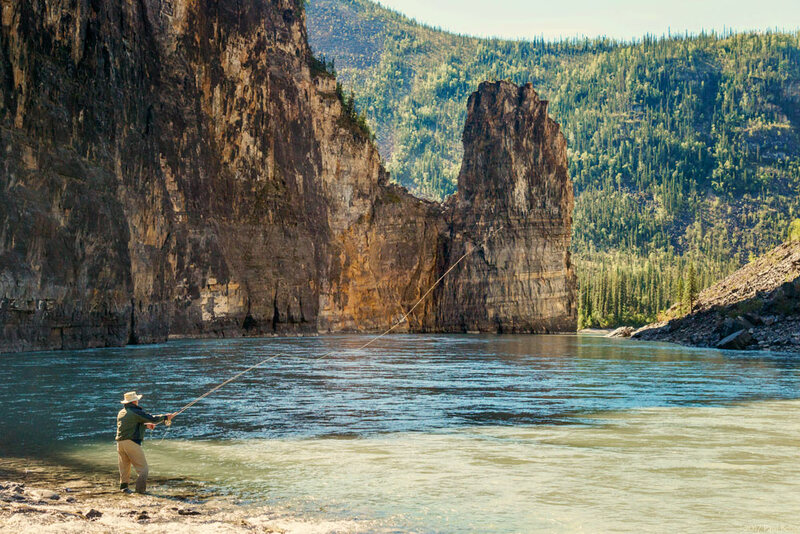 Fly fishing on the Nahanni River. Aim for compact “travel-sized” transportation of tackle. Collapsible rods are easiest and least likely to be accidentally broken. Generally speaking grayling, Dolly Varden, smaller Bull and Lake trout can be taken with lightweight spinning gear or a 4-6 weight fly rod. Northern pike, inconnu and any salmon require at least a mid-weight spin outfit with a solid reel or a 7-8 fly rod. Northern pike are very toothy and need a steel leader so the line won’t snap. Lure selection varies greatly, with Grayling, Bull and Lake trout and Arctic char taking smaller lures like mepps, spinners or little spoons. Grayling are known for taking dry flies on the main riffle of a creek as it enters the main stream. Flies can be wet or dry – try the red tag, royal coachman, Klinkenhammers, bead-head nymphs or smaller woolly buggers. Salmon love pixies or anything resembling an egg or a fly with a silver flash. Larger lake trout often like to be near the bottom, so anything that goes deep is generally a good idea. Northern pike stick to cover or weed beds and attack small mice, muskrat or frog patterns dragged across the surface. Here’s some information from our Grayling Guru Rod Taylor! Use a #5 a #4 or # 3 rod, reel and line combination. the smaller the number the more exciting the fight! In general Grayling are voracious fish so no need to over think your fly selection. That said, Grayling tend to be either hitting bright colours or dark/drab colours depending on the day. Dry fly fishing is the most fun as a Grayling hitting a dry fly is an exciting moment. If you could only bring one fly bring a “Black Gnat” dry fly in an #8, #10, #12 and #14 size. In general Grayling will hit flies that are much larger the you would likely think possible and in general, larger flies entice larger Grayling. After that a selection of drab and colourful flies in those sizes will work well. Some specific names that are known to work well – Royal Coachman, Elk hair caddis, Parachute Adams, pretty much any high-floating, caddis or mayfly initiation. For wet fly fishing, try a gold-ribbed Hare’s ear, a San Juan worm or any colourful or drab/dark beaded nymph. For spin casting, any small spinner such as a Mepps or a Panther martin will usually elicit a strike as will any shiny (including red) small spoons. Thanks for the information Rod! Arctic grayling, bull trout, lake trout, northern pike, whitefish. There are some land-locked char in the “upland lakes” according to the guidebook, but they have tapeworm cysts. Yum. And Soper LAKE has Greenland, Atlantic and Arctic cod. We strongly encourage “catch and release”. A small number of fish may be kept for a meal if you wish. Tight lines! If you plan to fish with artificial lures, such as plugs and spoons, consider replacing treble hooks with single hooks. Single hooks are quicker and easier to remove, especially when dealing with such predatory fish as bluefish and northern pike. Consider pinching the barb on your hooks, since this will make releasing the fish much easier. Plan your release strategy. Decide whether to keep or release any fish prior to angling or at least before removing the fish from the water. Familiarize yourself with any regulations in effect for the species targeted, and gather any items that will facilitate handling and releasing the fish. When a fish is hooked, use a steady, deliberate retrieval technique. This can reduce the amount of stress a hooked fish undergoes when pulled up from the depths too quickly, or when physically exhausted from an overly slow retrieve. Once you have decided on releasing the fish, avoid netting or even removing it from the water if possible. Use needle-nosed pliers to pry the hook from the fish while it is still in the water. Fish that can be lifted by the leader – the short length of line used to attach the end of the fishing line to the lure or hook – can easily be released over the rail using a “dehooker.” These devices, whether homemade or purchased, are gaining in popularity in the bluefish industry – to avoid the fish’s nasty teeth – and are useful for releasing a number of other species. A dehooker may simply be a metal rod with a handle at one end and a small upturned hook at the other end. If live bait or a lure is deeply embedded in the fish’s gullet, cut the leader close to the fish’s mouth and let the fish keep the hook. Studies have shown that fish can get rid of the hook up to 120 days later. When landing the fish, it is important to minimize out-of-water time and any fish contact with surrounding surfaces or objects. Avoid using landing nets if possible. If a landing net must be used, one with a neoprene bag rather than natural twine should be used. Neoprene removes less of the fish’s mucous coat. Do not use a gaff! Keep hands moistened. This helps prevent removal of the fish’s natural protective mucous layer, and reduces the chance of subsequent infections in the fish’s skin. Minimize handling, particularly of the gills and soft underbelly. Gently prevent the fish from battering itself on surrounding hard surfaces. Return the fish to the water headfirst. In most cases, it is best to point the fish’s head straight down and allow the fish to plunge down into the water. Klauber, A. 1992. Catch & Release. In: Nor’easter: Magazine of the Northeast Sea Grant Programs. Fall/Winter 1992. Malchoff, M.H., M.P. Voiland, and D.B. MacNeill. 1992. Guidelines to Increase Survival of Recreational Sport Fish. Cornell Cooperative Extension Fact Sheet.